Compensation committees have seen increased scrutiny the past several years, and governance committees will likely see a similar focus in 2016. The compensation committee has been on the hot seat for several years. Outrage regarding executive pay and its perceived role in the financial crisis has put the spotlight on the board members who serve on this committee. Say-on-pay, the non-binding shareholder vote on executive compensation practices, was one of the first new Securities and Exchange Commission (SEC) requirements implemented as part of the Dodd– Frank Wall Street Reform and Consumer Protection Act in 2010. Since that time, public companies have responded to shareholder feedback and changed compensation programs and policies to garner support from shareholders and advisory firms such as Institutional Shareholder Services (ISS) and Glass Lewis & Co. In recent years, only 2 percent of public companies have “failed” their say-on-pay vote. The significant majority of public companies (approximately 75 percent of Russell 3000 companies) received shareholder support of 90 percent or greater during the 2015 proxy season. Today, companies with less than 90 percent should increase their shareholder outreach, as a dip below that level is often an indicator of emerging concerns. Compensation committees can’t sit back and relax on these results. The SEC’s proposed rule for pay versus performance disclosure (published in April) and the final rule for the CEO pay ratio (published in August) will further intensify the focus on executive pay and require compensation committees to dedicate much more time and energy to evaluate and explain their pay decisions in light of these new disclosures. Fortunately, implementation of the CEO pay ratio is delayed until the 2018 proxy season while the SEC has not yet adopted final rules for the pay versus performance disclosure (as of September). It is hard to predict what influence these additional disclosures will have on shareholders’ say-on-pay votes. What is clear is that boards will need to monitor these and other pending Dodd-Frank Act rules (i.e. mandatory clawback, disclosure on hedging policies, incentive risk management) in the coming year. 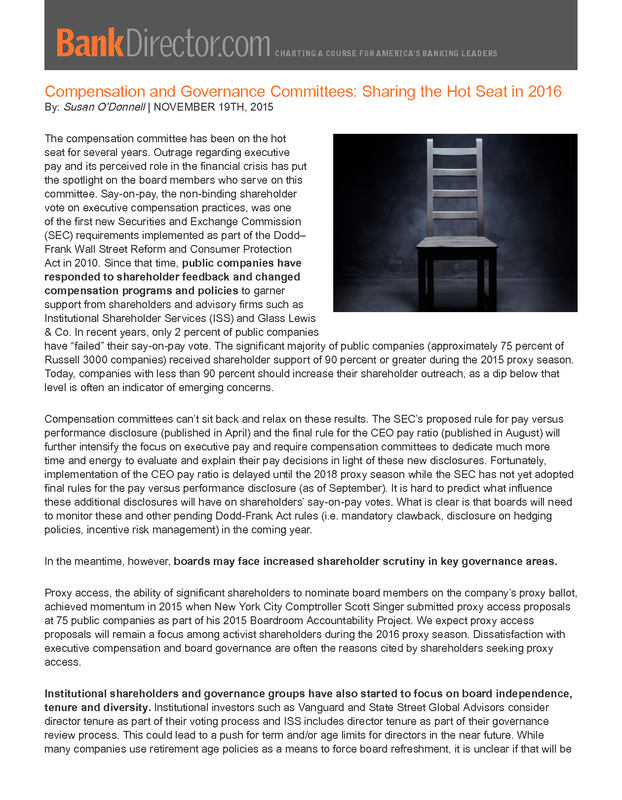 In the meantime, however, boards may face increased shareholder scrutiny in key governance areas. Proxy access, the ability of significant shareholders to nominate board members on the company’s proxy ballot, achieved momentum in 2015 when New York City Comptroller Scott Singer submitted proxy access proposals at 75 public companies as part of his 2015 Boardroom Accountability Project. We expect proxy access proposals will remain a focus among activist shareholders during the 2016 proxy season. Dissatisfaction with executive compensation and board governance are often the reasons cited by shareholders seeking proxy access. Institutional shareholders and governance groups have also started to focus on board independence, tenure and diversity. Institutional investors such as Vanguard and State Street Global Advisors consider director tenure as part of their voting process and ISS includes director tenure as part of their governance review process. This could lead to a push for term and/or age limits for directors in the near future. While many companies use retirement age policies as a means to force board refreshment, it is unclear if that will be enough. Boards would be wise to start reviewing their board composition and succession processes in light of their specific business strategies but also in consideration of these emerging governance and shareholder perspectives. The intense scrutiny by investors and proxy advisors of public companies’ compensation and governance practices shows no signs of abating. Bank boards will need to develop their philosophies, programs and policies with an acknowledgement of emerging regulations and perspectives. Board composition and processes such as member education, evaluation, nomination and independence will gain focus. Executive pay levels and performance alignment will continue to be scrutinized based on new disclosures mandated by Dodd-Frank. 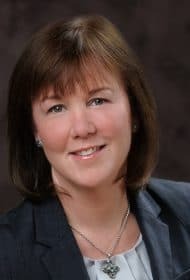 The spotlight on pay and governance is not winding down, but rather widening and both the compensation and governance committees will need to spend more time addressing these issues in the years to come.